I was fortunate to meet Felicia Alvarez out west at Floret last spring. She is one of those magnetic people- innately kind, incredibly sweet, and very interested in learning about and supporting others' stories. It is wonderful to be able to share her story here and introduce you to the new Menagerie Farm & Flower. Read on for our Q & A session with Felicia! Q: Can you share a little about your background and why you've decided to grow roses? A: I was raised on a prune farm in Northern California and studied Crop Science and Agricultural Business in college. After university I spent over 15 years in various farming roles within the vineyard and wine industry from Vineyard Manager & Pest Control Advisor to Direct Sales Manager and eventually owning my own winery. Four years ago I decided to sell my winery and move back to the family farm to raise my family. Today I farm over 100 acres of land that includes prunes, rice, walnuts, assorted speciality fruits, cut flowers and garden roses. I am an accidental rose farmer. About three years ago my rose “gardening" on the farm became more than my hobby when a local florist who was a friend of my husband’s visited the farm and asked if he could use some of my roses in his designs. As they say the rest is history. This fruit farmer became a flower farmer. Now, in addition to my fruit and nut crops I also specialize in growing garden roses as cut flowers and a limited selection of other specialty flowers seasonally like tulips in the spring and dahlias in the summer. Q: Is there a story behind the name Menagerie? A: Our farm is a collection of the historic people and crops that have farmed our land and the promise of the diversity that will come in generations to come. That is why we chose the word Menagerie. We really are a diverse collection of agricultural products that has evolved over time from grains, to fruits and flowers and who knows probably wine again someday, too. Q: What makes the place where you are growing well-suited to serving as a rose farm? And what kind of environment do they require generally? A: Roses grow well in my climate in California because they get 6 full hours of warm dry sun and very mild winters so we have more of an extended growing season. We technically have only two months between frost dates but some years the roses never really go into true dormancy because we just don’t get enough consecutive cold days. This season is a perfect example with very mild winter weather. I was cutting roses on Christmas Day. I have bushes, that I decided not to winter prune as an experiment, that are still flowering today in January. My specific farm location also lends itself to rose production because I am at the base of a dormant volcano and have really fertile soil. With our long growing season I can get 6 or more flushes per year depending on the variety and weather. Other flower farmers or home gardeners in other zones could be equally as successful growing roses but may not have as many flushes per year as I do so they wouldn’t be as a profitable of a crop for the initial investment and room they require. I do have my fair share of pests like aphids. Thrips can be a problem even in my growing region but luckily they haven’t been for me yet. I don’t have many disease issues like mildew or black spot since I am not in a humid or coastal climate. Generally, roses are very hardy plants and can survive in almost any environment as long as you select varieties that are suited for your zone. You can grow them in any location with 6 hours of sunlight, well drained soils and protection over the winter, if needed. They don’t like wet feet but do like a constant level of moisture. Q: People often claim that roses are difficult to care for. What's your opinion and/or do you have a general list of recommendations for how to care for them over the course of a year? A: This is somewhat of a tough question to answer since specific care really depends on your growing zone. Cold weather regions will need to mulch more in the winter and humid regions will require more disease control. Variety selection really can be the key to success at growing roses. Pick the right plant for the right location. I think the difficulty (and the reason that roses sometimes have the reputation for being hard to grow) is that care really depends on your climate. As long as you can pick the varieties, a good site location and do the cultural practices that work well in your climate, then they are a relatively low maintenance plant. I don’t grow pineapples because I don’t live in a warm humid tropical climate - I would be wildly unsuccessful - so I’ll leave that to the farmers in Hawaii! I also live by the practice that even if it’s a popular rose variety if it doesn’t grow well for me I rip it out and put in one that does. The time and maintenance on a poor performer just isn’t worth it. Local Rose Societies or Master Gardeners are great resources for specific recommendations of varieties unique to their growing regions. Mulching - 2-3 inches around the base. Spring fertilizer around the root zone. Water deeply and frequently to retain moisture but no wet feet. Avoid overhead watering on foliage since that promotes disease. Soaker hoses or a drip system work the best. Compost tea spray every 2 weeks. Monitor for pests and diseases. Address any issues quickly when spotted. Fertilize throughout the season as needed. Dead head blooms throughout the season to encourage more growth. This really is key if you want continuous blooms. 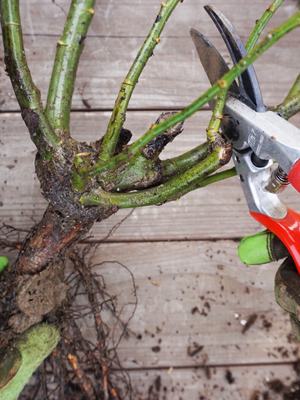 Remove any diseased or old leaves from the base of the plant. Start the cycle all over again. Q: Do you have any fun/interesting rose facts to share? A: There are more than 15,000 rose species grown worldwide and it wasn’t until the twentieth century that the United States began issuing patents and copyrights on names and cultivars. Q: We have a number of readers who will be interested in your shop. What special plants/resources will folks be able to find there at Menagerie Farm and Flower? Throughout the growing season I offer cut roses and other specialty cuts for sale (wholesale only) to floral designers and farmer-florists. I’m really excited because this season will be my first for shipping roses across the country. Unfortunately, I don’t offer any retail cut flower sales at this time. In the future I hope to expand and sell my favorite products for rose growing that you can’t find at a local big box nurseries or Amazon including clippers, gloves and a proprietary blend of mycorrhizae I’ve developed that I use for planting bare root roses and trees. I also will have videos and information on rose planting & care for growing roses as cut flowers. Q: Which zones do your plants serve? Are there any places people can look this year for really cold tolerant varieties? A: My bare roots for sale will serve Zones 3-10. In general Zones 3-5 will have roses that perform much better on own root and survive the cold Winters. They will do better with extra mulch layers and if you really want to baby them with frost cloth protection also. Zones 5-10 can do either own root or grafted successfully depending on care, maintenance and personal preference. Just check an online product listing or hang tag of the rose at the nursery to see the recommended growing zone. Dr. Huey grafted roses are the most commonly used in the United States. They are what you will find on pretty much any grafted rose at a big box store and non specialty nursery. They are more vigorous producers in a warm climate, like mine in Zone 9b, so I prefer them because I get more blooms quickly and as a farmer that’s what my goal is. Own root roses also perform well in my climate but can take longer to get established and I may not get as many blooms off of them the first or second year. Grafted roses can be more sensitive to hot and cold temperatures so if you select a grafted be sure to look for the type of rootstock suited for your type of weather. There are many types in addition to Dr. Huey but some of the most common are Fortuniana rootstock that is great for warm humid climates like Florida but doesn’t like cold climates. Multiflora likes more cold wet weather climates like Oregon and Western Canada. I could do a whole article just on rootstock selection! As for varieties that love cold weather I recommend the Canadian Parkland Series. All of the Mordens are nice for cuts. I don’t sell them but you can ask at a local specialty nursery in your area or order from another online store like High Country Roses. Q: Is there a certain date that we should mark our calendars for? A: To be the first to get notification when my bare root selection goes on sale they can visit my website www.menagerieflower.com and get on the Bare Root Rose waiting list or my Newsletter for general articles rose and flower planting tips. Thank you, Felicia, for sharing so much helpful information. For more information about roses at Menagerie be sure to visit the link above. Welcome to the flower community, Menagerie!